Compared to humans, the cat’s sense of taste is weak. We have 9,000 taste buds, while they have only 473. They make up for this deficiency with a superior sense of smell. The preferred temperature for feline food is 86 degrees Fahrenheit–the same temperature as the cat’s tongue. Food straight from the refrigerator doesn’t appeal to Kitty, whose wild ancestors ate freshly killed prey. 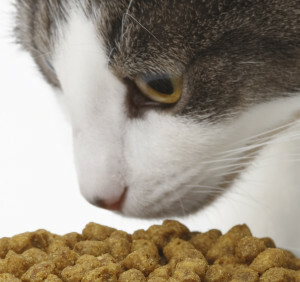 Try heating Kitty’s food to intensify the aroma if he is not eating well. Like humans, cats are responsive to four basic tastes: sour, bitter, salt, and sweet. Being strict carnivores, their response to “sweet” is much weaker than ours, almost to non-existence . As the cat’s most powerful response to food is through his sense of smell, not taste, is it any wonder that he may simply sniff at the expensive delicacy you just put down for him and walk away (or try to bury it) without even tasting it?